Dr. Martin Luther King, Jr. is celebrated here in Durham, North Carolina. Local events honor him with speeches from notable leaders as well as music, theater and dance, and arts by gifted performers. The MLK/Black History Parade happens Saturday February 2nd. Rev. Dr. Martin Luther King Jr.’s life will always be remembered and celebrated for his nonviolent marches, articulate speeches, and devotion to freedom for all. Dr. King brilliantly stated that what really matters is the content of a person’s character not the color of their skin. 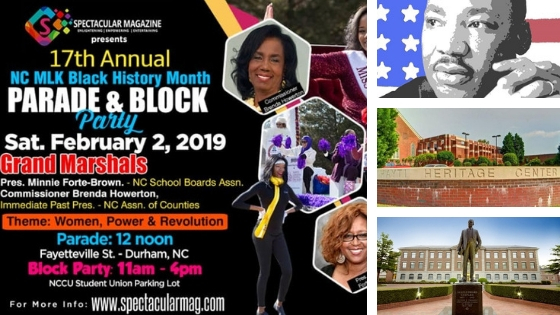 MLK “Remembering the Legacy Through the Arts” Event takes place on Saturday, January 12 from 2 to 5 pm at the W. D. Hill Recreation Center at 1308 Fayetteville Street. This event is free and open to the public. Call (919) 560-4292 for more information. On Tuesday January 15, at First Presbyterian Church at 305 East Main Street in Durham, from noon to 2 pm, the Durham City-County MLK Celebration with their talented choir hosts this event. Local leaders and elected officials will give their remarks. The keynote speech will be presented by The North Carolina Supreme Court Justice Anita, a former civil rights attorney and professor as well as the founder and former executive director of The Southern Coalition for Social Justice. Call 919-560-0000 for more details. Later on January 15, from 6:30 pm to 8:30 pm, the St. Joseph’s Historic Foundation and the Hayti Center partner with NCCU’s Departments of Music, Theater and Dance, and Art, who will collaborate on the MLK Celebration to honor Rev. Dr. Martin Luther King, Jr. A free program highlighting Dr. King’s life and showing how all these art forms supported the activists who joined with him to achieve civil liberties and freedom. On Saturday, February 2nd, the City of Durham hosts our Annual MLK/Black History Month Parade beginning at W.G. Pearson Magnet Elementary School at 4501 Fayetteville Street from noon until 2 pm. This event is free to the public. The Block Party starts at 11 am and goes until 4 pm at the North Carolina Central University Student Union Parking Lot. Morehead Manor Bed and Breakfast in Durham welcomes you to stay at our 8,000 square foot Colonial-Revival style home. We are within walking distance to the Downtown Area, the Durham Performing Arts Center (a top-five entertainment venue in the country), and the historic Brightleaf Square. Each morning guests savor our delicious gourmet breakfasts. This entry was posted in Events and tagged black history month, Jr., Martin Luther King by admin. Bookmark the permalink.